Today’s topic goes hand-in-hand with yesterday’s post about imagination. Creativity and imagination are siblings. They egg each other on and support one another. They share a lot of DNA, but they have differences. While imagination is more internal, creativity is external. It takes whatever the imagination visualizes and makes it tangible. One of the amazing powers of children’s literature is its inspiration to create. 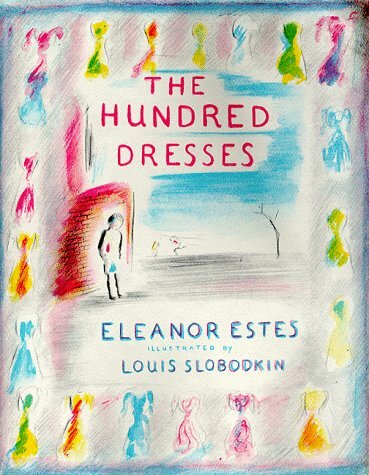 When I was in elementary school, I read Eleanor Estes’ book THE HUNDRED DRESSES. The story tells of a girl from a poor family who is teased for her shabby dress. She tells an obvious lie that she has 100 dresses at home, and her classmates demand a daily description of each of the hundred dresses. When the school has a drawing contest to design a dress, the girl submits 100 elaborate drawings of dresses, which silence her classmates when they are awed by her artistic skill. I barely closed the book before I decided to draw 100 dresses. I grabbed my colored pencils, a fresh notebook, and went to work. I never made it to the double digits in dress designs before I abandoned the project, but I enjoyed every minute of my fashion design while it lasted. Library story hours also are prime examples of creativity sparked by children’s literature. Most story hours feature a reading, followed by a craft project or activity. Children’s books feature some of the most creative, dynamic designs in and of themselves. Pop-up books, texture books, and stories that feature cutouts or moveable parts are common in the young literary market. They showcase creativity of production as well as inspire creativity. Do you have any creative projects inspired by children’s books? If so, feel free to share them in the comments below! This entry was posted in Reading and tagged Children's Book Week, children's books, creativity, kid lit, reading. Bookmark the permalink. May 6, 2015 at 9:57 p.05. It’s actually funny, because I just realized that kids’ games can have the same effect. Right now, I’m writing a short story based on the Clue game we have. Isn’t it amazing where we find inspiration and what plants stories in our minds? I know, right? You’d be amazed how much we can be inspired by little things.